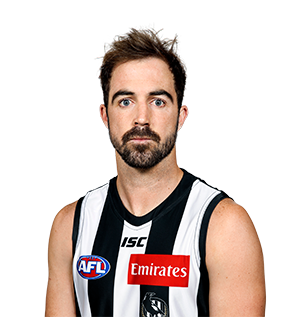 Collingwood champion Steele Sidebottom has won the Gary Ayres Award for the best player of the 2018 AFL finals series. Collingwood champion Steele Sidebottom came within four votes of securing the club’s tenth Brownlow Medal on Monday night. Find out how each Magpie voted during the 2018 Brownlow Medal count. At 26 years of age and with 185 games under his belt, we still may be yet to see the very best of Steele Sidebottom. That alone is a scary thought for opposition midfields. The vice-captain has been at the Holden Centre for almost a decade, and is a model of durability and consistent performance. Years of persistence finally paid off in 2017, when he won his first Collingwood Best and Fairest. The youngest of five brothers, Sidebottom is one of the fittest players at the club, and his engine, coupled with his goal sense, has made him a versatile option for his coaches. His disposal on both sides of his body is a feature of his game, as is his tenacious tackling. His reputation as a finals specialist, fuelled by a best afield display in the 2008 TAC Cup U18 Grand Final, was sealed in 2010 when he was one of Collingwood's best in both the drawn Grand Final and the Replay. While playing in September has evaded Sidebottom and his teammates in recent years, the midfielder will be at the forefront of a group with a strong desire to return to the finals in 2018 and beyond. Another 22 games for the man in number 22 in the season past. And it was this campaign that was arguably Sidebottom’s best in Black and White. The numbers alone suggest the midfielder’s dominance. Playing predominantly on the wing, his disposal average of 27.2 was just a touch shy of his career-best numbers in 2015 (27.3), while he had more clearances per game (3.45) than in any other season at Collingwood. A pre-season specialist, Sidebottom burst out of the blocks against the Western Bulldogs in round one. 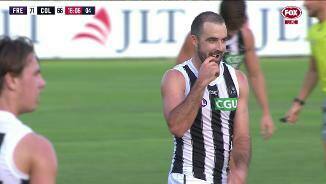 He kicked Collingwood’s first goal of the season midway through the first term, and added another in the second quarter of a 35-disposal, six-clearance game. The clash with the Dogs would be one of eight 30+ possession games for Sidebottom in 2017. 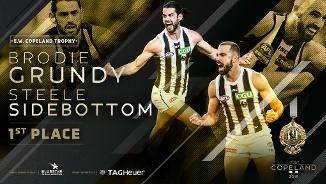 The ultimate workhorse, Sidebottom has made a routine of playing in the shadows of superstar teammates like Scott Pendlebury, Dane Swan and Adam Treloar. However late in 2017, he took centre stage. Sidebottom assumed the captaincy role in round 18 in the absence of Pendlebury, and impressed both as a leader and in his regular on-field role. An All-Australian nod again evaded Sidebottom in 2017, despite Pendlebury staking his teammates claim as “close to the best winger in the comp”. However the 26-year-old did break through and receive well-deserved recognition on Copeland Trophy night. After top-five placings in 2012, 2013, 2014 and 2015, he claimed the Magpies’ highest individual honour – edging out Taylor Adams by one vote to win his first Copeland Trophy. With a blistering NAB Cup behind him, Steele Sidebottom was poised to become something special in 2015. After two goals, 19 possessions and a dominant first three quarters against Brisbane in round one, the midfielder truly appeared on the cusp of a breakout season. However sights of the midfielder unable to use his right hand to shake hands with opponent’s post-game sent questions of a different kind through the football world. Sidebottom had broken his thumb and it would be six weeks until he would be able to return. Not content with the weights and running associated to a rehab program, Sidebottom elected to train with the main group one-handed just under a month after the initial injury. As unconventional as the approach was, it clearly worked as Sidebottom made a triumphant return with an impressive 32-disposal game against the Gold Coast in round eight. There were difficult times ahead. After wins in all five of his first games, a tough seven-point loss to Richmond in round 13 started a run of six straight defeats. Determined to maintain a winning attitude, Sidebottom failed to agree with defeat. Between the Magpies losses to Hawthorn in round 14 and the Western Bulldogs in round 17, the 24-year-old had a remarkable 132 disposals at an average of 33 per game. The standout came against the West Coast Eagles in a rare home game at Etihad Stadium in round 16. Sidebottom was everywhere as he finished with 38 touches. It was one of many in a season Sidebottom will no doubt remember as a journey containing a number of highs and lows. While a total of 16 games is his lowest tally since his debut season in 2009, strong form when he was on the park saw the midfielder finish with a career-high disposal average of 27.3 touches per game. Consistency has been Sidebottom’s trademark during his six years as a Magpie, and so it proved in 2014 when he produced a season worthy of second placing in the Copeland Trophy count. He played 19 senior games, missing just three through a suspension that followed an uncharacteristic collision with St Kilda’s Maverick Weller in the opening minutes of Collingwood’s win in round 11. Sidebottom struck a purple patch during his side’s wins over North Melbourne and Essendon in April, polling five of a possible six Brownlow votes in the space of just six days. He kicked three goals, laid six tackles and won 26 disposals on ANZAC Day, further reinforcing his reputation as a big game player. The 23-year-old remained one of his side’s most influential players in the months that followed, polling three votes for his 33 disposals, nine tackles and two goals against Carlton in round 15 – his first match since his suspension in round 11. As a raft of teammates hit the wall through injury, Sidebottom ploughed on until season’s end, winning 30 or more disposals in four of his last six games, including a season-high 36 against Hawthorn in round 23. In finishing second in the Copeland Trophy, Sidebottom continued his upward trend first established in 2012 when he finished fourth in the coveted award. Sidebottom was one of three Collingwood players to play in all 23 games in 2013. His form was consistent all season long. It started off with Sidebottom spending time deeper inside 50 and ended after a stint as a distributor at half back. Sidebottom opened the season with three goals, 21 disposals and a Brownlow vote against North Melbourne and cut Richmond to pieces with four goals and 21 possessions in round four. So consistent was his early season form that he polled one Brownlow vote in five separate matches. As the year wore on, Sidebottom began to spend more time behind the ball and was effective with five rebound 50s in his 100th game against Adelaide and later against the Bombers in round 19. A perennial big game player, Sidebottom had 29 possessions and four tackles in the loss to Port Adelaide in the Elimination Final. Third place in the Copeland Trophy was a fitting reward for another consistent season. As expected, the hard-running forward was offered the challenge of spending more time in the midfield last season and embraced the role wholeheartedly, playing every game but one. Had a strong first half of the season before he lost a bit of consistency after the bye. Signed a two-year contract extension in June and came fourth in the Copeland Trophy. Premiership success continued to follow him as he was a member of the side’s NAB Cup triumph over Essendon. Didn’t miss a match all year despite having only just turned 21 on the eve of the season. Improved in all statistical facets of his game, highlighted by his 28 disposal and three goal performance against the Western Bulldogs in round six that earned him three Brownlow votes. Continued to establish himself as a tenacious tackler, a standout performance of 11 tackles against West Coast in round 10 adding to his 107 for the season. His impact lessened as the year wore on, kicking only three goals in his last seven games. Didn’t let the side down in the Grand Final, though, with 23 possessions and two goals in the loss to Geelong. Backed up his exciting finish to 2009 to play 25 of the 26 games in the club’s premiership year. Missed only one match due to a calf strain, and contributed 24 goals. His personal highlight was a five goal, 16 disposal haul against the Kangaroos in round seven. Won a career-high 28 disposals in round 21 against Adelaide, and saved his very best for the finals. Kicked three against the Bulldogs in the qualifying final, two against the Cats in the preliminary final, and was one of Collingwood’s cleanest ball users in the Grand Final draw with St Kilda. Came within a whisker of a Norm Smith Medal seven days later when he accrued 25 possessions and kicked two goals. Finished eighth in the Copeland Trophy - a remarkable effort considering he was yet to turn 21. Spent the first six weeks in the VFL before opportunity knocked at senior level. Paul Medhurst’s late withdrawal paved the way for Sidebottom to debut against St Kilda on a Monday evening at Docklands in round seven. Despite the 88 point shellacking, Sidebottom was not disgraced as he gathered 22 disposals. He made steady progress, yo-yoing between the seniors and the VFL for much of the year to play 11 games in total. Came of age in the semi final against Adelaide when he had a career high 25 disposals, 10 tackles and seven marks as the Pies won by less than a kick. The night confirmed Sidebottom’s status as a big game player, remarkable considering he was only 18 years of age. Played for the Murray Bushrangers U18s in the TAC Cup. Represented Vic Country at the U18 National Championships. Sprung to prominence in the TAC Cup Grand Final, when he kicked 10 goals, had 34 possessions, 14 marks and 10 clearances from the midfield to win the TAC Medal. Was selected by Collingwood with pick No 11 in the National Draft. A member of the AIS-AFL Academy intake.